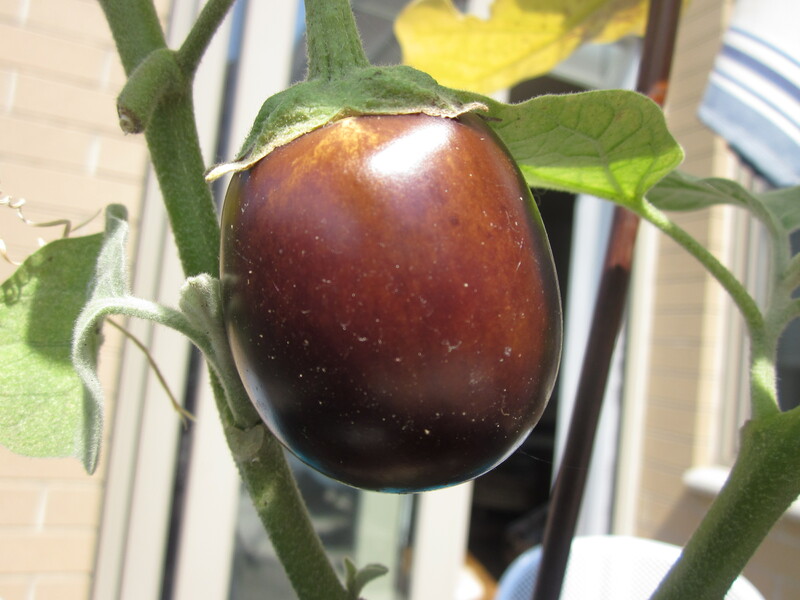 I don’t know what is more abundant, the summer eggplant crop or the recipes on what to do with all of them. And here I am joining the fray with one of my own. This one is not unfamiliar. It’s the summer version of eggplant parmigiana. 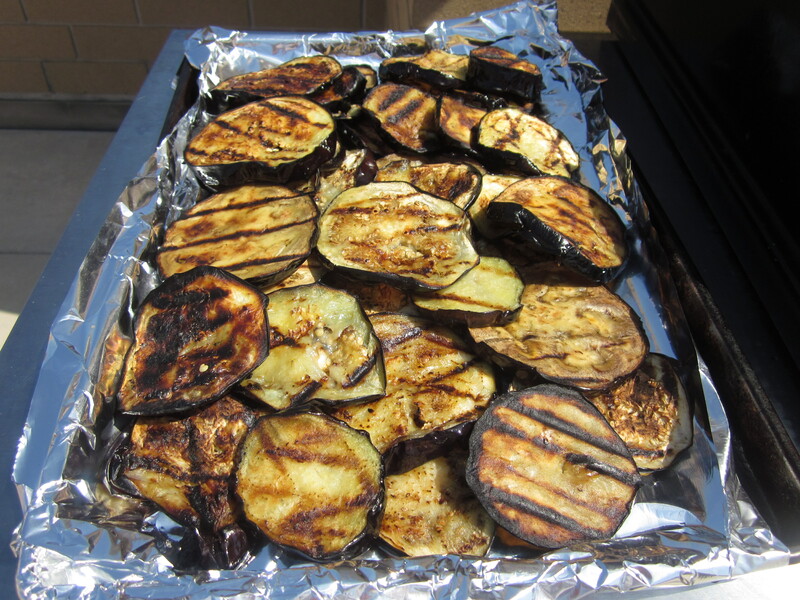 The difference between the summer and non-summer is that the eggplant is grilled as opposed to the traditional egg-dipped, breaded and then fried (though my non-summer version is baked, never fried, but that’s another story). 2 medium to large eggplants-sliced into ½ inch rounds*. Salt and crushed red pepper to taste. *You could peel the eggplant if the tough skin bothers you. I peel them when I am making eggplant parmigiana in the oven. But I think charring the skins adds to the summery flavor of this dish. 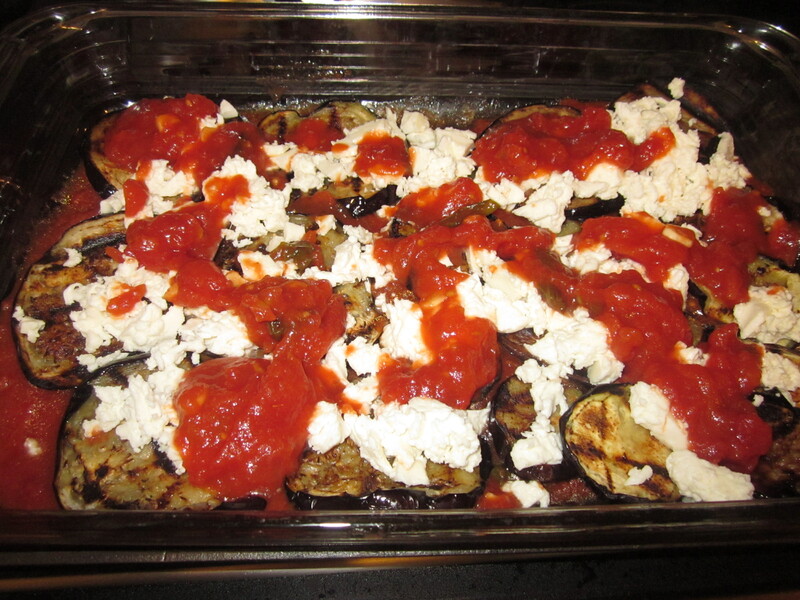 After slicing the eggplants, sprinkle with salt (Kosher or sea salt preferred) and coat with olive oil. If using a gas grill, turn it on and warm it up. Using a charcoal grill is a bit trickier, but the results will be more satisfying. 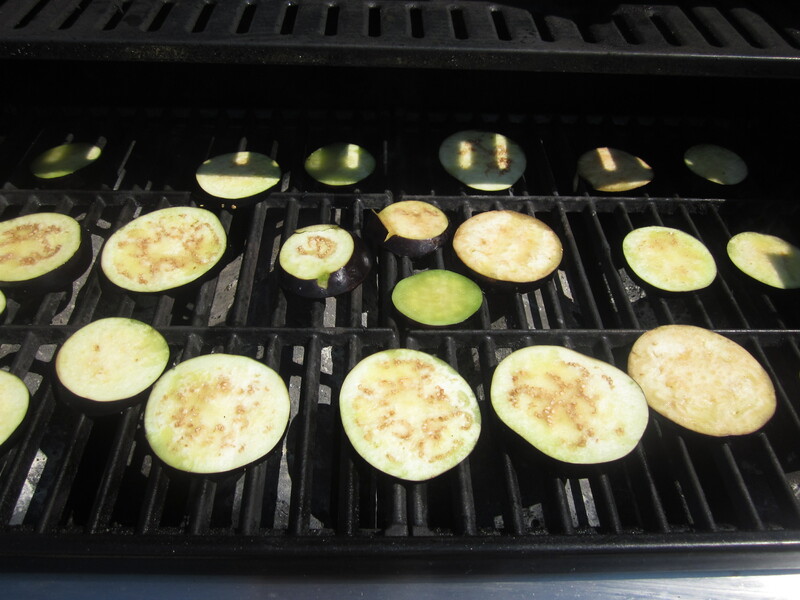 The eggplant will gain a smoky flavor that can’t be replicated with the gas grill. The problem is trying to keep the eggplants from falling through the cooking grate as a sacrifice to the charcoal gods. You’ll need one of those vegetable and/or fish baskets to go over the original grate. I have yet to find one I really like so I tend to cook vegetables on the gas grill. And even when grilling on a gas grill, I usually lose a few through the grates no matter how careful I am. 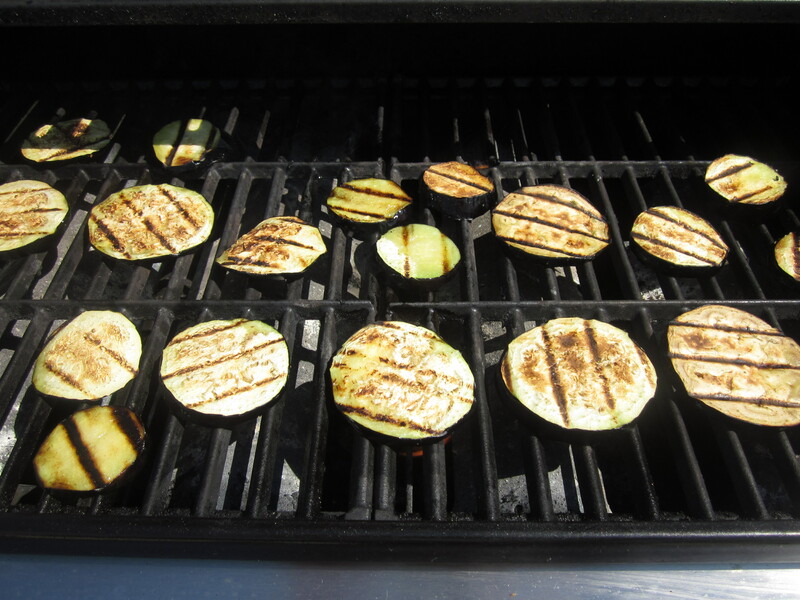 Grill the eggplant until it has that nice, even Coppertone tan. Tan lines, in this case, are more than acceptable. 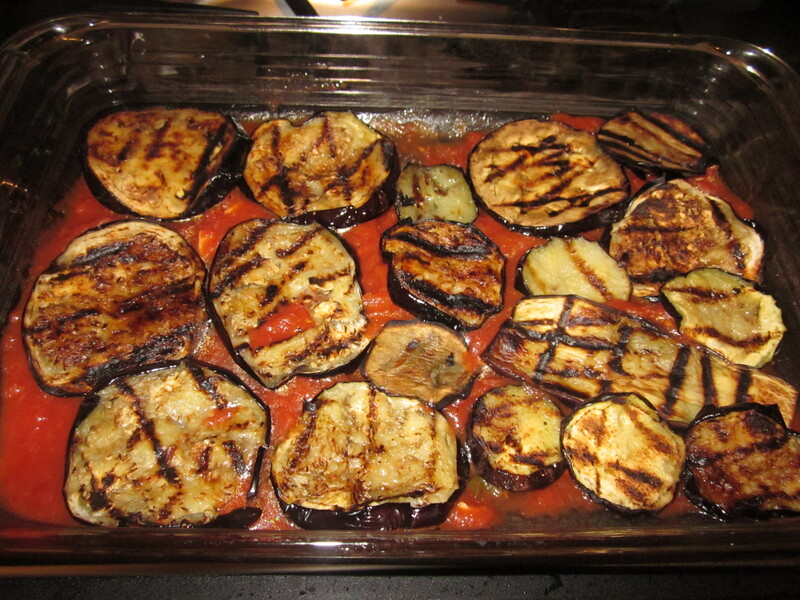 The char lines from the grill grate add to the beauty of the eggplant’s appearance. 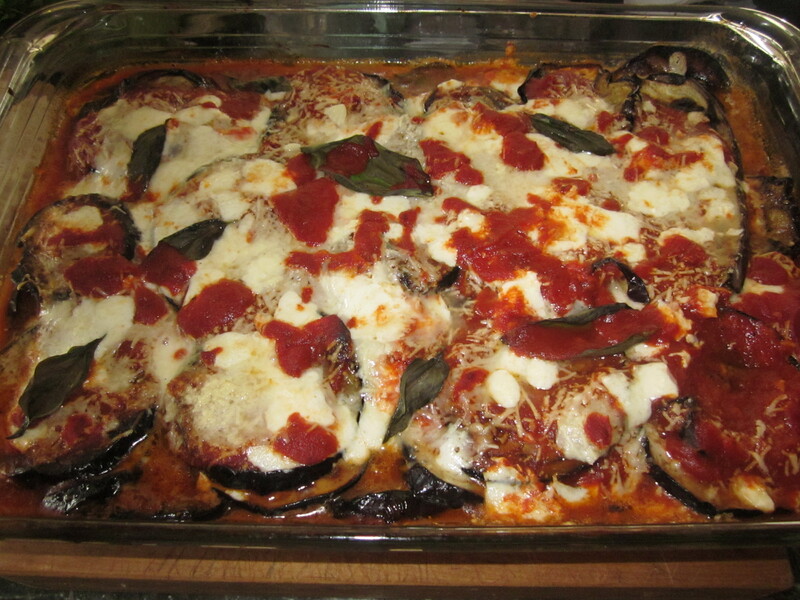 Remove the eggplant from the grill and let them cool while you put the parmigiana together. Pre-heat the oven to 375 degrees. Using a 9 inch, by 13 inch baking dish, (or something similar) spread about a cup and a half of the tomato sauce on the bottom of the dish. Arrange the eggplant slices on top of the sauce, add another half cup of sauce over the eggplant and sprinkle half of mozzarella over all. 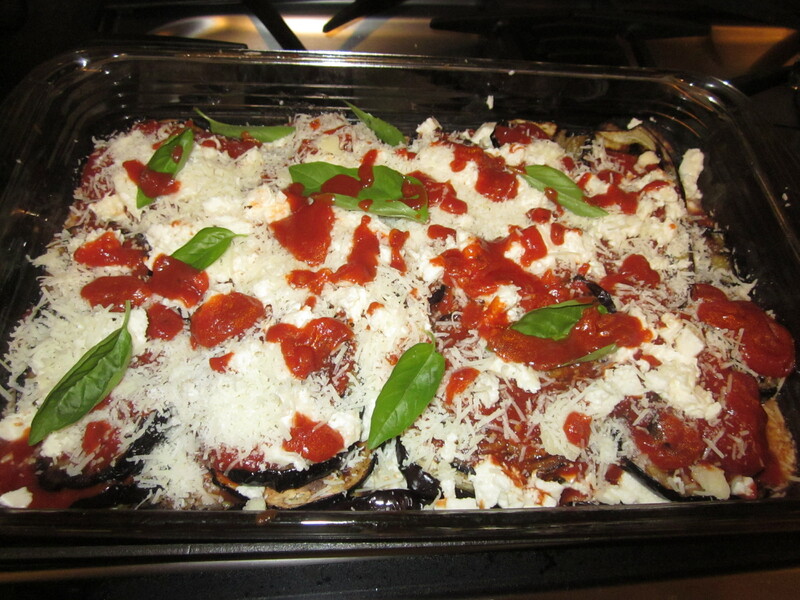 Add another layer of eggplant slices and repeat with the sauce and mozzarella. Continue until you have used all the eggplant. Make sure you’ve saved some sauce and mozzarella to coat the top of the last layer. Scatter the fresh basil leaves evenly over the sauce and mozzarella and then sprinkle the parmigiana cheese over all. Put the dish in the oven and cook for about 15 or 20 minutes or until the sauce bubbles and the cheese has melted. Remove from the oven and serve warm. 2 cloves of garlic, sliced or chopped. (The finer the slice or chop, the more garlicky the flavor). Empty the tomatoes in a bowl and crush with your hands. Pour the olive oil into a skillet and heat to medium-high. Add the garlic and cook until very slightly browned. Add the crushed red pepper and basil and a moderate sprinkling of salt. Bring to a simmer and cook for 20 minutes. 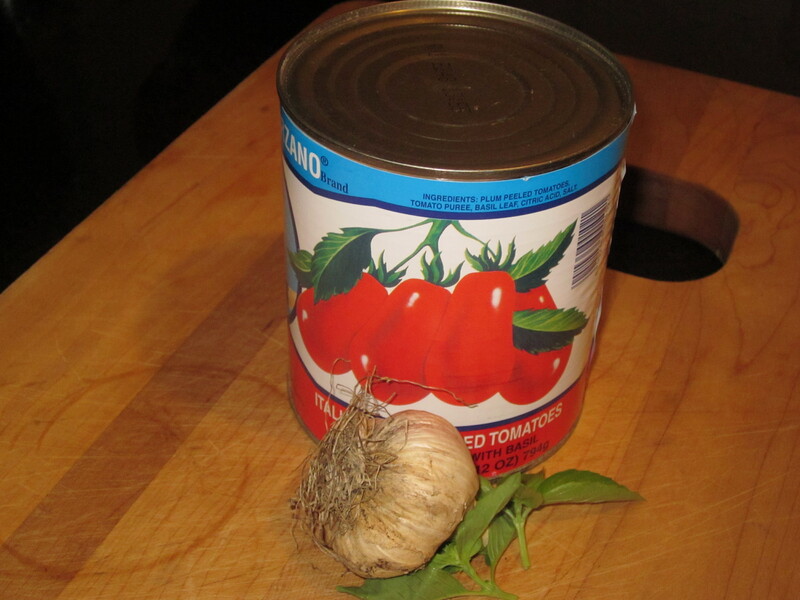 Marinara sauce can be made well ahead of time and kept in the refrigerator for up to a week or frozen and then thawed when needed. Richard …now you know what to do with the eggplants from your garden. Brian is a great cook.